The original card I sent to my granddaughter never made it to her, so I made this replacement. I really am liking the color combination on this and they go so well with the Sparkling Summer set from Stampin' Up. The sentiment is from Stampingbella and speaks to all those yummy images on the card. The flowers are from Flora Doodles by Petaloo and are centered with a rhinestone brad from Stampin' Up. 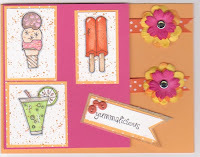 The cardstock is from Papertrey (Raspberry Fizz, Summer Sunrise and Summer Sunrise Bitty Dot Basics).